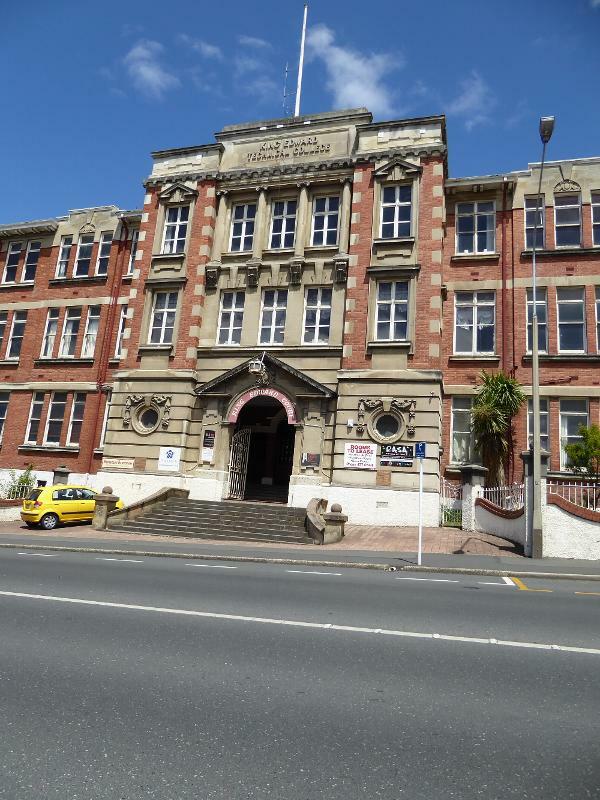 What did Dunedin 1 (Commercial) overlook? Plenty. The city has two icons, and they're damned near interchangeable. 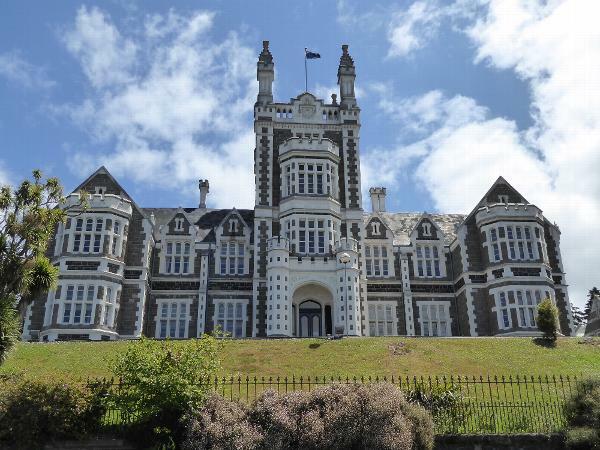 Here's the first, the 1879 main building of Otago University. 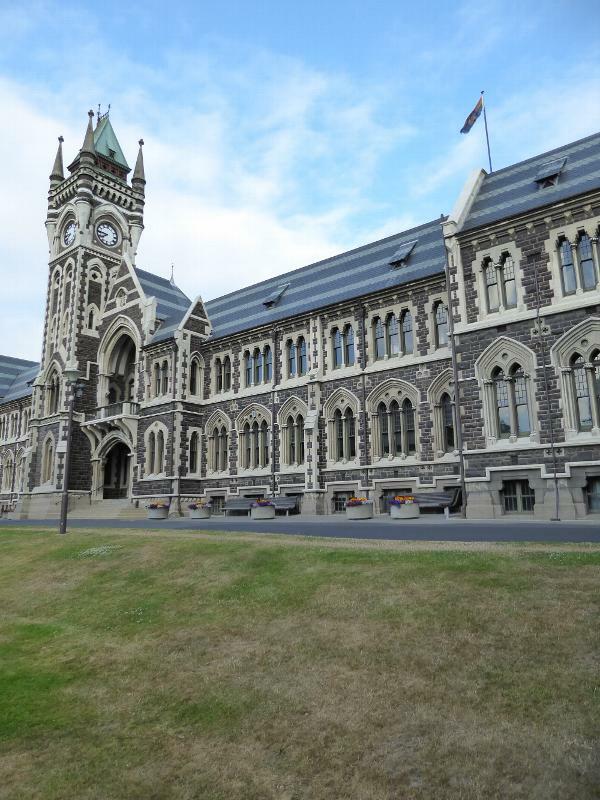 This was New Zealand's first university, opened eight years before this building's completion. The building is probably more stately now than 50 years ago, when streetcars ran, clang-clang, along the far side of the creek just below this lawn. 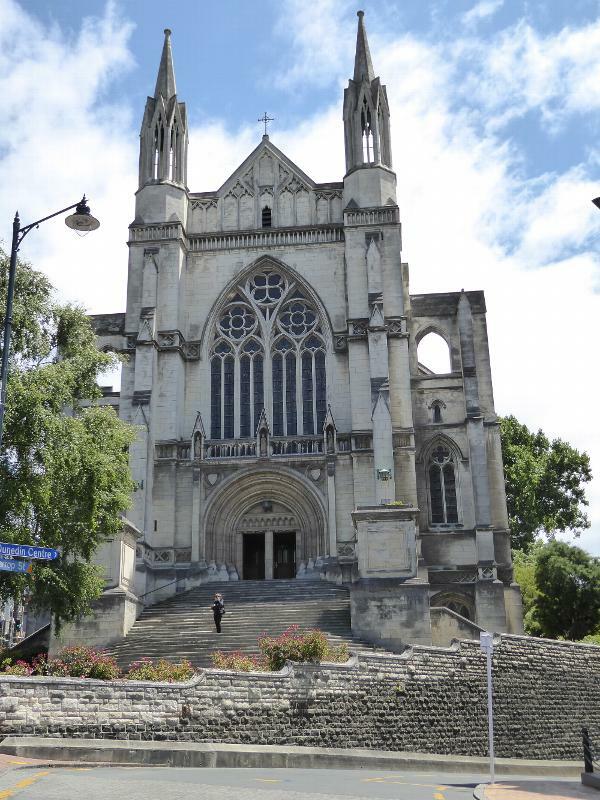 The architect was Maxwell Bury of Nelson; the facing is from two local stones, Oamaru limestone and a gray basalt perplexingly called bluestone. 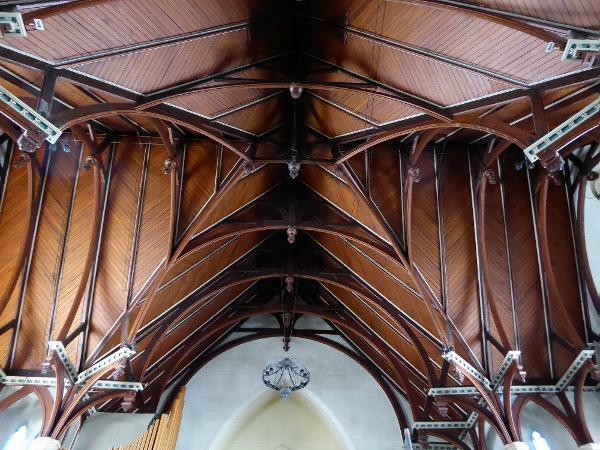 Bury's model was perhaps Glasgow University, designed by that Victorian eminence, George Gilbert Scott. 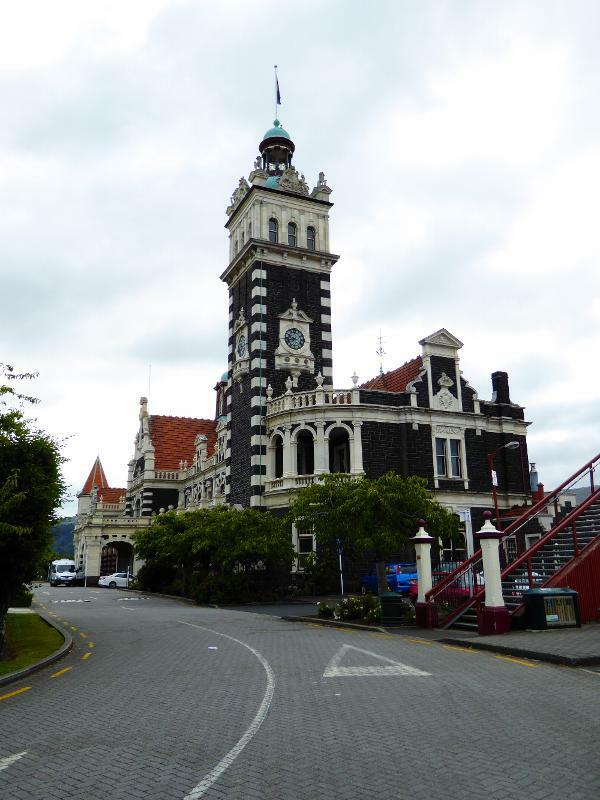 Here's the other icon, built of the same materials and roughly of the same design but 30 years later: it's the city's railroad station, completed in 1906. 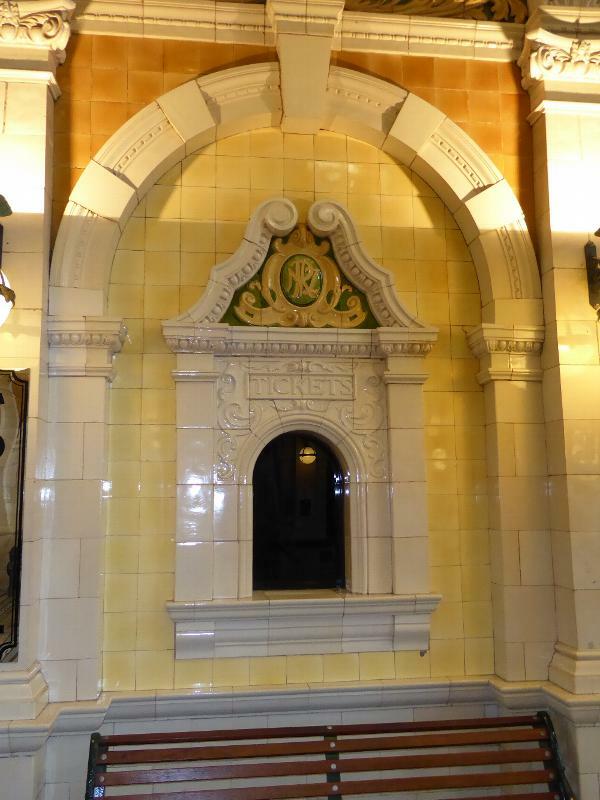 It's the third station on the site. 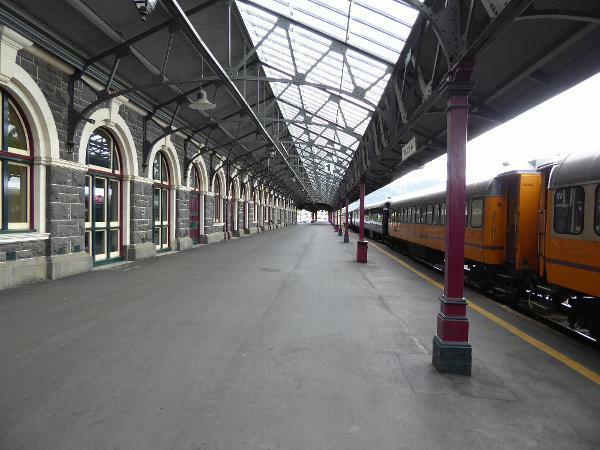 The facade is long, befitting what was once New Zealand's busiest railway station. 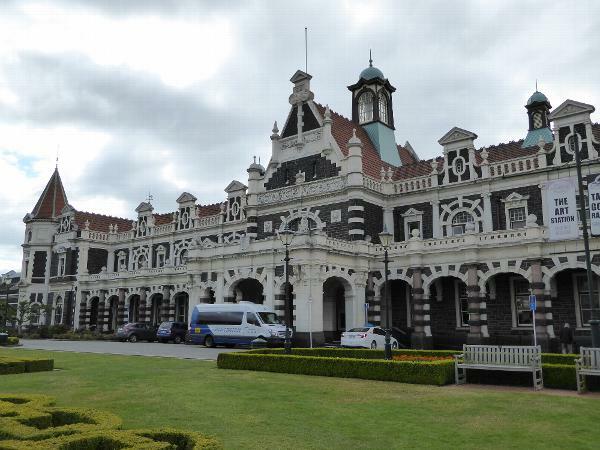 The architect was George Troup, who emigrated from Scotland at age 21 and became a draftsman at New Zealand Railways. He eventually got a nickname: "Gingerbread George." There he is at the bottom. The E.R. at the top is a bit tricky for those of us accustomed to decades of Elizabeth. Anyway, we can step inside. 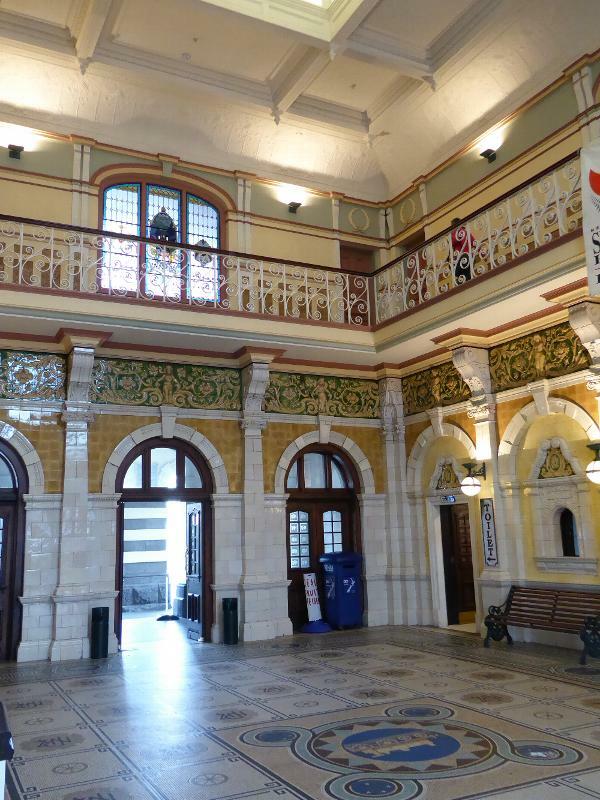 The ticket hall is not the work of cringing colonials. The Evening Star wrote in 1906 that "the heterogeneity of its structure has been the subject of some adverse criticism..." but "the whole atmosphere of the place is one of costliness." This extended to the plumbing: "The lavatory and sanitary arrangements are luxurious." 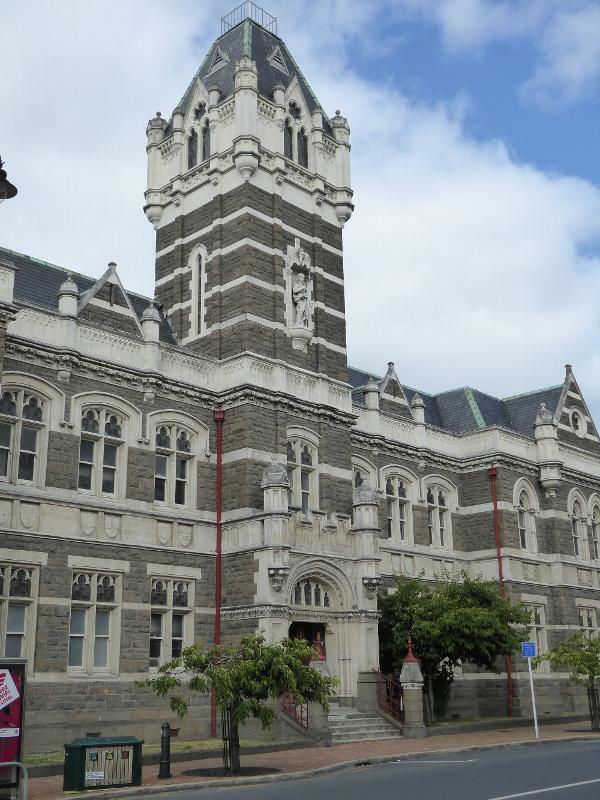 See Hardwicke Knight and Niel Wales, Buildings of Dunedin, p. 235. Tile can be clinical, but not here. No passenger trains run up-island now, but there's a short-line for tourists. And here's a third of these limestone-bluestone confections. It's just across the street from the train station, from whose lawn this picture was taken. 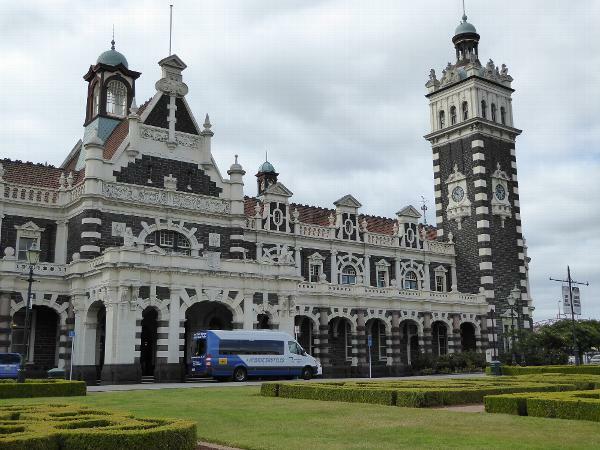 It's the law courts, designed by the government architect, John Campbell, and completed in 1902, a few years before the station. A main street runs past the courts and up to the Octagon, a set of several concentric octagonal streets forming the civic center. Yes, that's Justice without her blindfold. Interesting that the towers here and on the station are lower than on the university. Loss of nerve? Blame instead the load-bearing capacity of the flat ground, which was created by dumping fill along the shoreline. Down comes the gavel, off goes the convict to the nearby jail, done mostly in brick to save money. 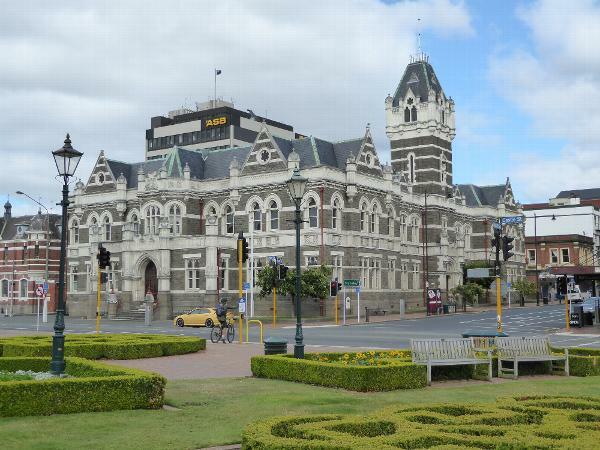 Here's the Municipal Chambers, built in 1880 and overlooking the center of the Octagon. You can see from the slope of the land that we've moved from filled land to terra firma; even so, the tower was removed in 1964 for fear of earthquakes. People missed the old tower, and so an earthquake-proof replica was built. 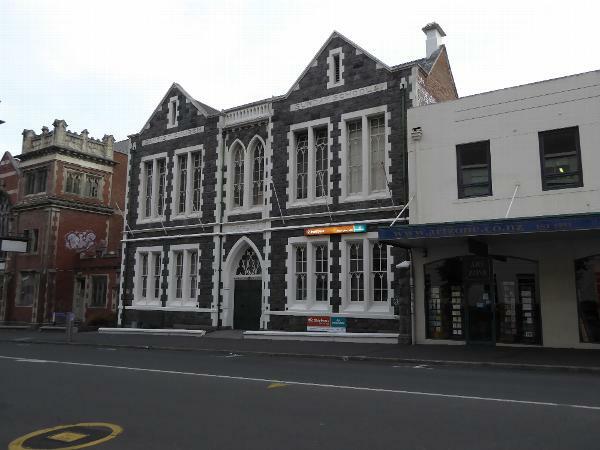 The building's original architect was the same Robert Lawson met in Dunedin 1, but here he was liberated from warehouse-and-brewery plainness. 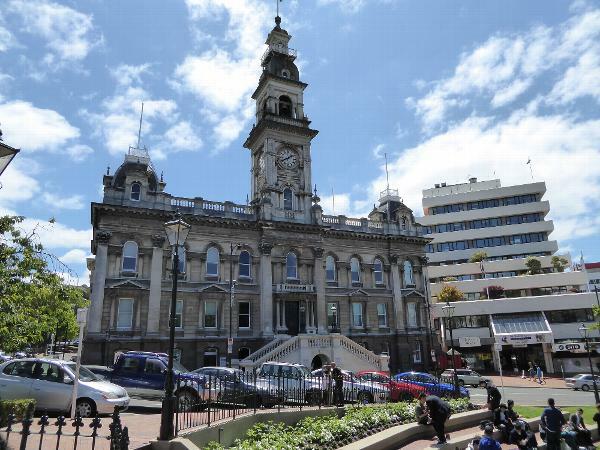 Niel Wales writes that this building gave "Dunedin a civic dignity it had never had before." The building on the right is the mega-inspirational Civic Center, added in 1982 for council staff. What? You like it? 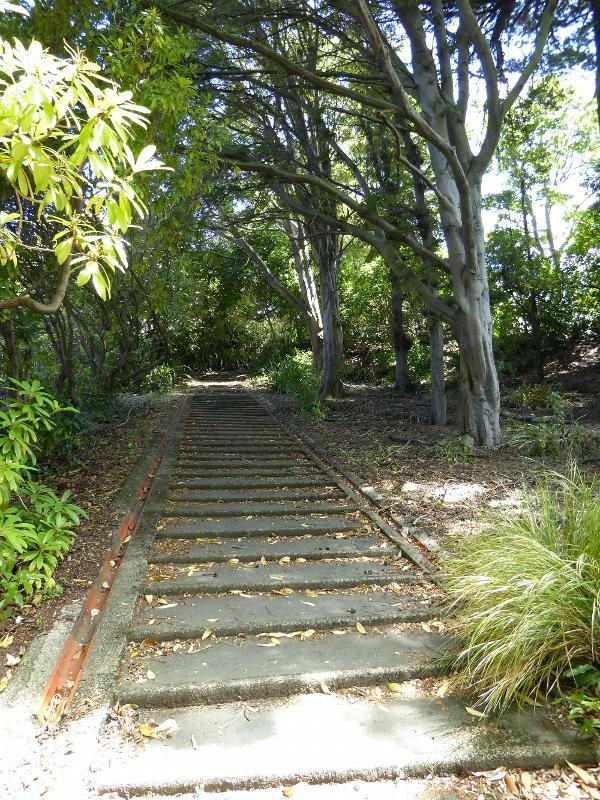 Well, take heart, Dunedin has more like it. You just won't see a lot of it on this website, which has standards to maintain. See Knight and Wales, p. 146. 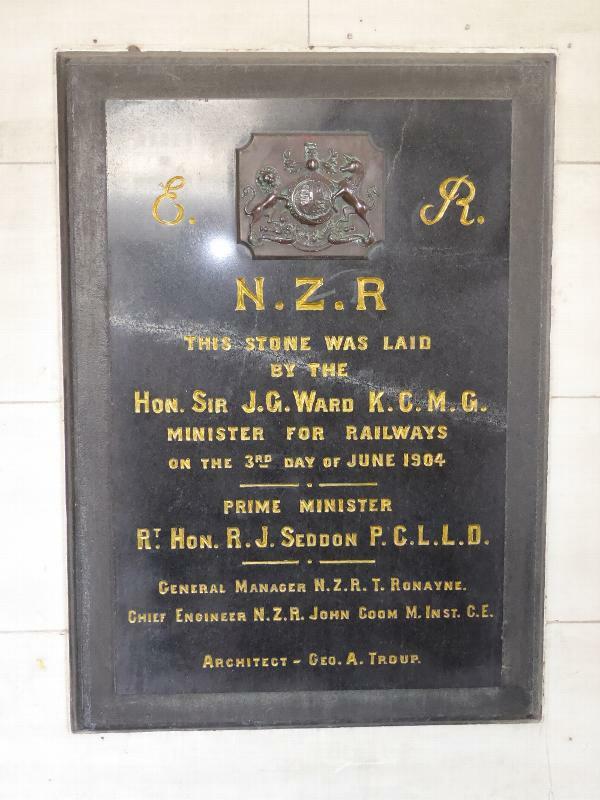 For a photo of the building when its tower was truncated, with a simple ogee cap over the clock, see K.C. McDonald, City of Dunedin, 1965, after p. 336. Just to the back of the Municipal Chambers but in a radically different style, this is the Town Hall, opened in 1930 when cities still wanted grand meeting places. This one seats 3,000. It has had to adapt to a world where people prefer smart phones, so you can buy a ticket to a movie here and find yourself in a gloomy room that seats perhaps 100. You can tell from the limestone and bluestone that there must be something important back here. 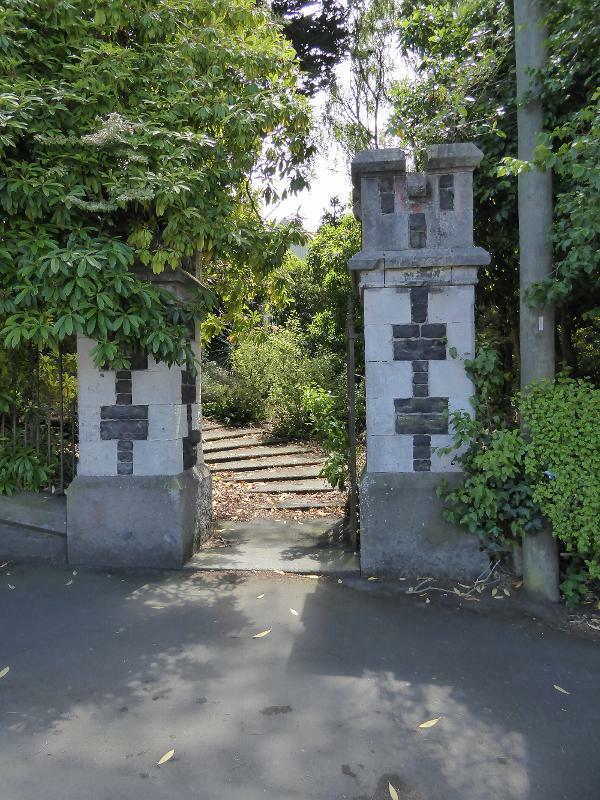 Forget the modern building at the rear; just look at the gate, which presents another Great War reminder. 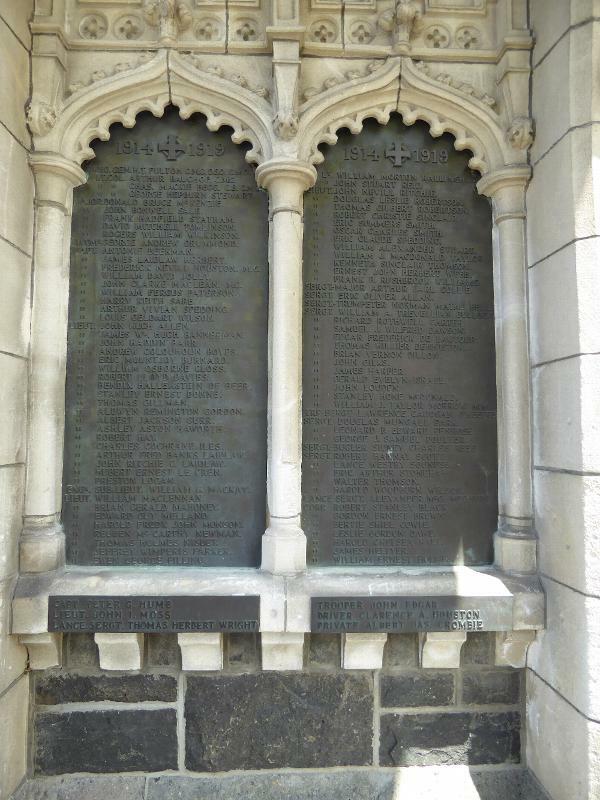 You can just make out a hint of the brass plaques set into the interior sidewalls. Figured out where the gates lead? 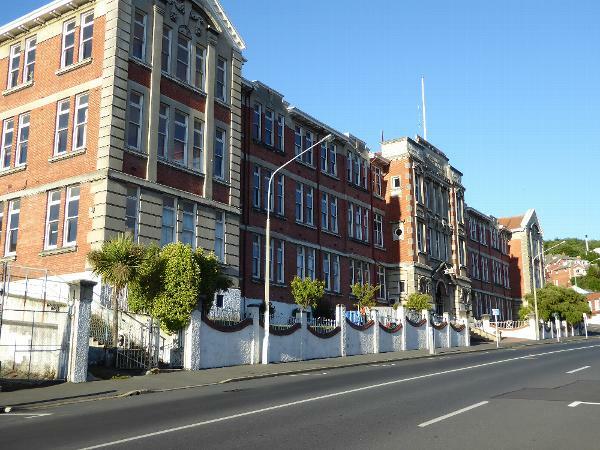 The Boys' School opened originally on a different site, and that site in turn became this, Otago's Girls' High School, the first girls' high school in New Zealand and reputedly the first in the Southern Hemisphere. 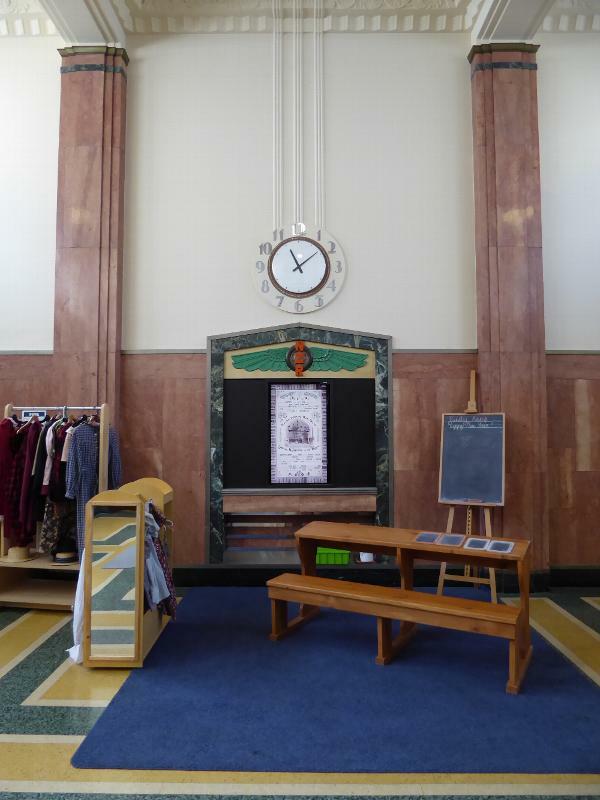 It's housed in the Dalrymple Building, which opened in 1910 and is named for Miss Learmonth Whyte Dalrymple, one of those women on whom so much social progress depends. She fought through the 1860s for the creation of a girls' high school at a time when... well, you know the wretched rest. Another school, this one for the plebs. Can't read the words up top? Now you can. 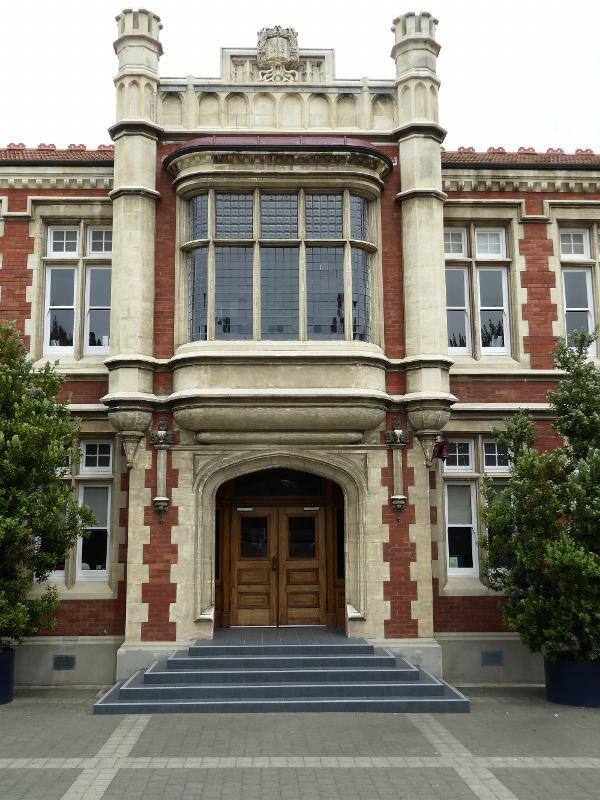 The school opened here in 1889, though this building is a bit later, from 1913. 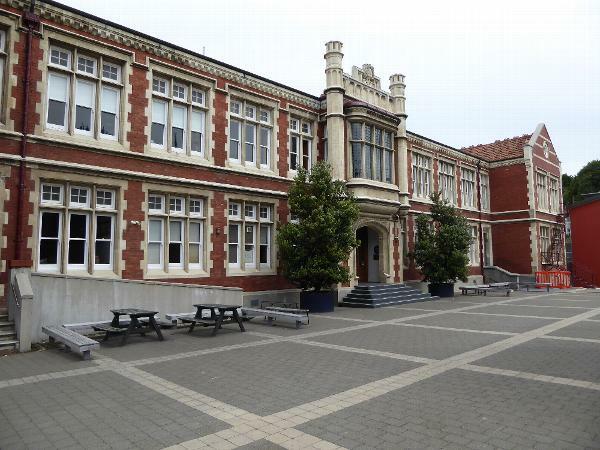 It split in 1966 to form the King Edward High School and Otago Polytechnic. 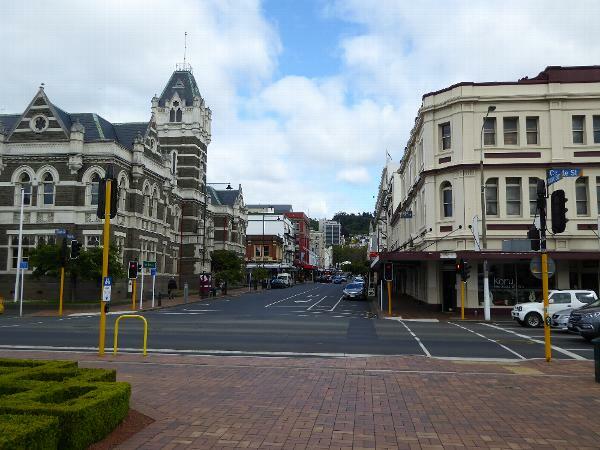 We should probably make room for another Dunedin icon. 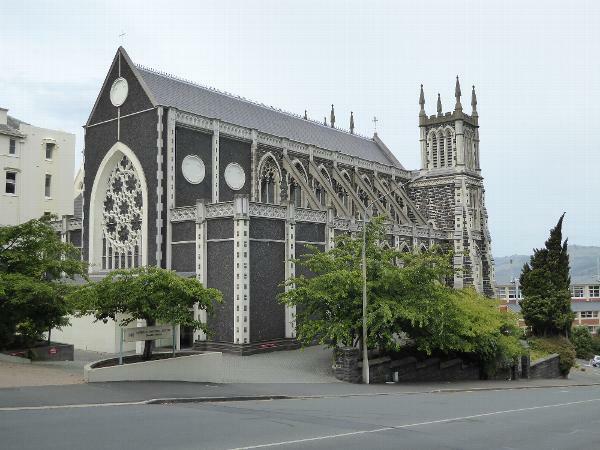 Here she be, a church that looks like one of those outrageous tropical fish with extreme sexual dimorphism. I mean, it's all spire, rather like Ava Gardner saying that Frankie was short but all... tut, tut. I'll behave. This is the First Presbyterian Church, familiarly the First Church. 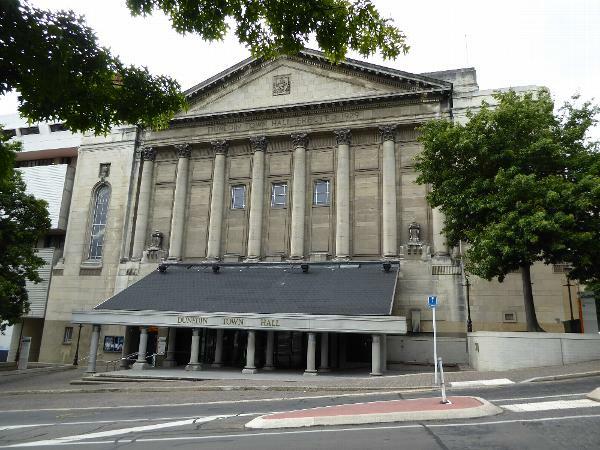 You shouldn't have to ask the name of the architect: yes, it was busy Mr. Lawson, though he never saw it completed, because he had retired to Australia by the time it opened in 1873. The church stands on Bell Hill, which was obligingly chopped down to create a reasonable surface. 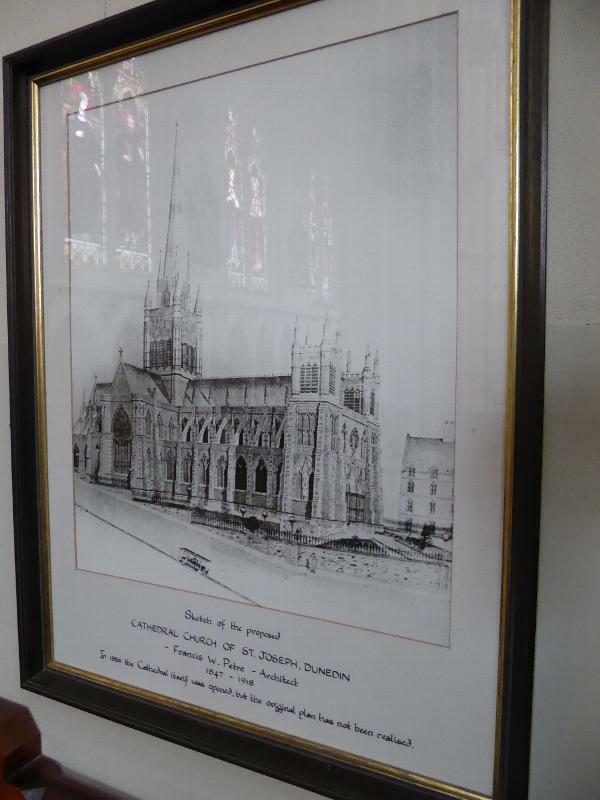 The church is the child of the Reverend Thomas Burns, a pioneer who arrived with one of the original settlement ships, the Philip Laing, and who stayed until his retirement in 1871. Come to think of it, he never saw the church finished either. 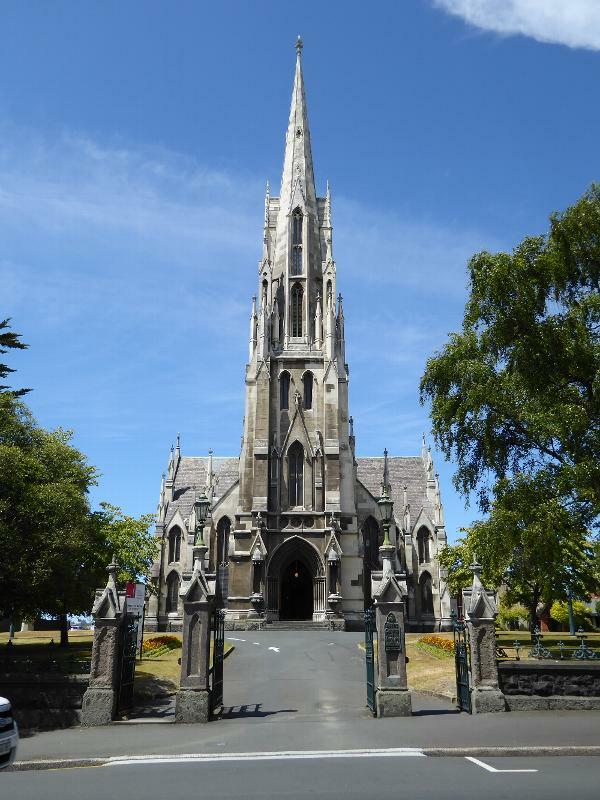 Dunedin's Catholics had their own grand plan, with twin towers, a transept, a mighty spire on the crossing, and flying buttresses. The towers came along, but the nave had to be simplified, the transept dropped, and the mighty spire forgotten. 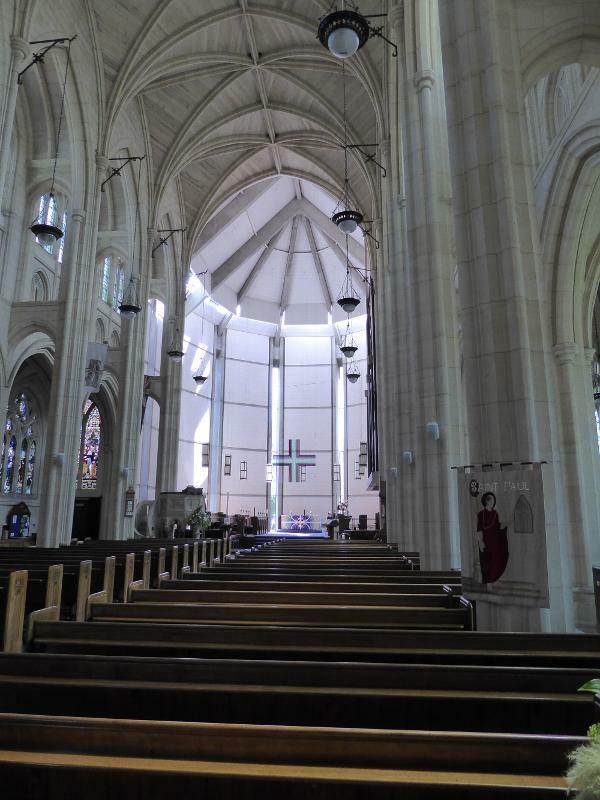 The interior is underwhelming, especially in comparison with the First Church. The Anglican church is St Paul's, with a grand marble staircase at the center of the Octagon and next to the Municipal Chambers. Replacing an older church built on the site in 1863, this one was consecrated in 1919, when the builders must have been exhausted. 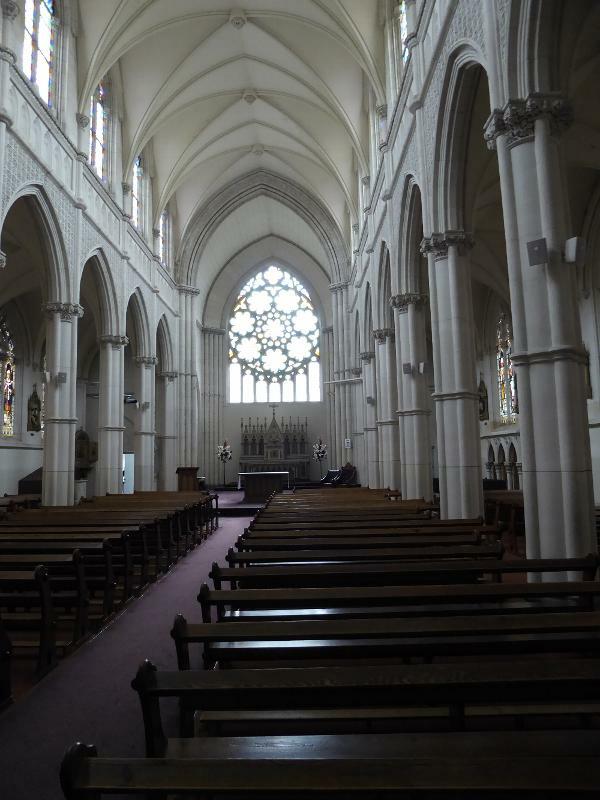 Wales writes that Edmund H. Sedding, the architect, "was such a wonderful architect...." Wales calls the church "an ageless building, clean, clear, and serving for the future." See Hardwicke and Wales, p. 220. The nave is roofed with vaulted limestone; you just have to overlook the chancel, completed in 1971 with an acrylic hanging cross. 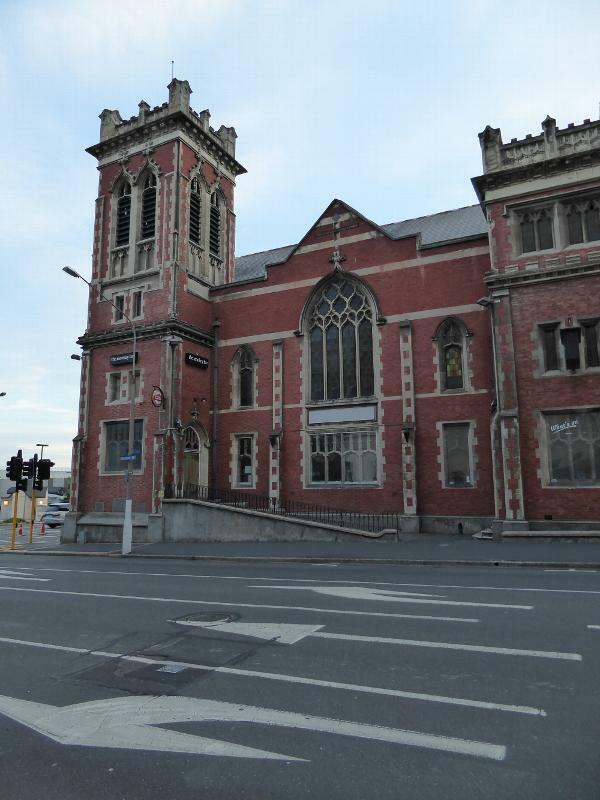 Last church on our rounds: the ex-Methodist, now desanctified. Speaking of schools, this one's waiting for a location scout working on a movie about the joys (such, such joys) of Victorian schooling. 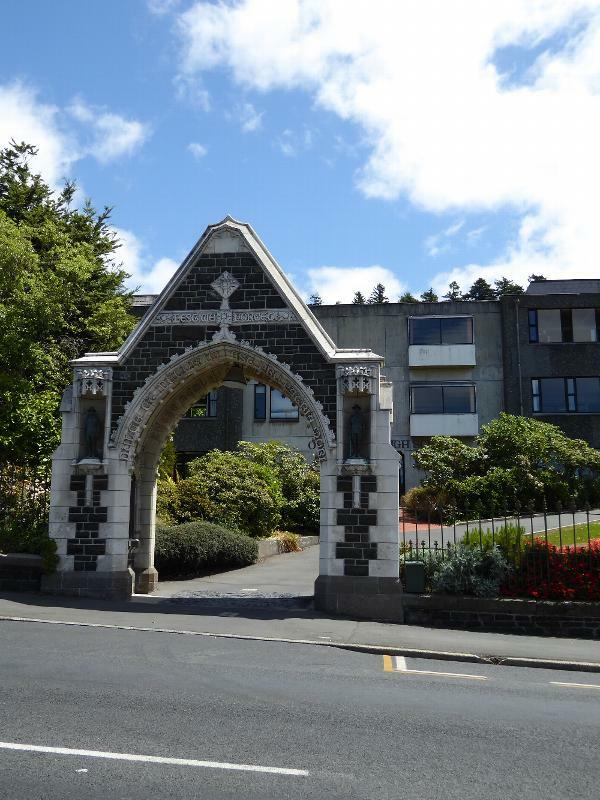 It's St. Dominic's Priory, opened in 1871 by a group of Dominican Sisters who arrived in Dunedin in 1871 with the first Catholic bishop. 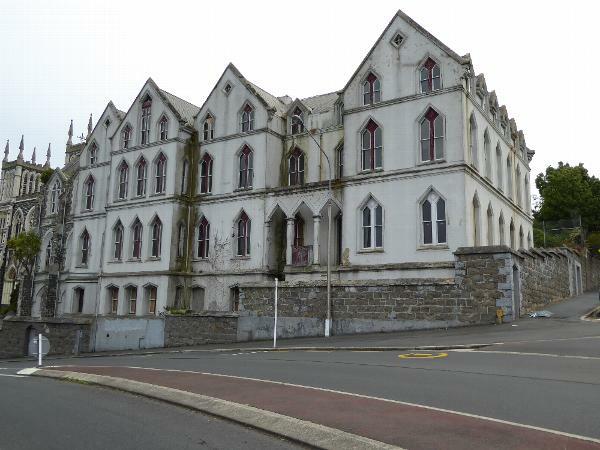 It was both a boarding and a day school, and the Sisters continued here until 1983. The architect was the same F.W. Petre who designed the adjacent St. Joseph's. He had a nickname: "Lord Concrete." 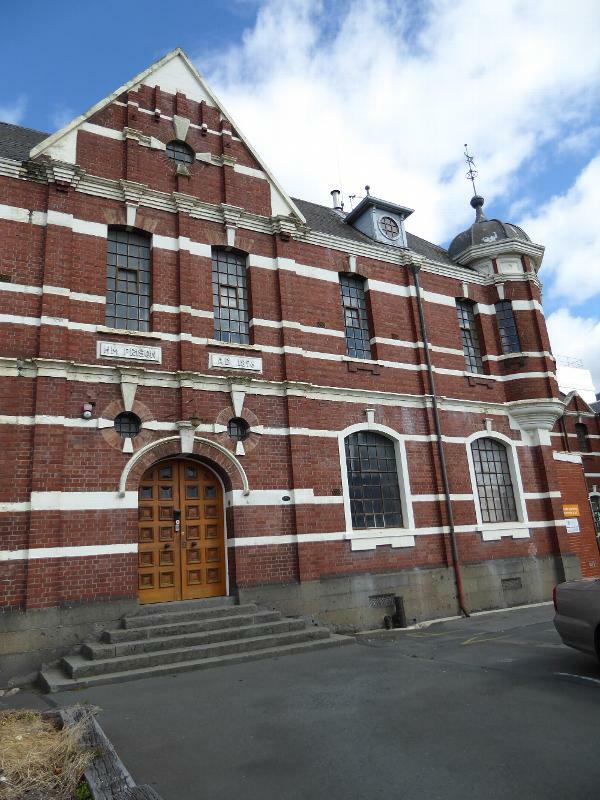 We're going to take a look at the Otago Settler's Museum. 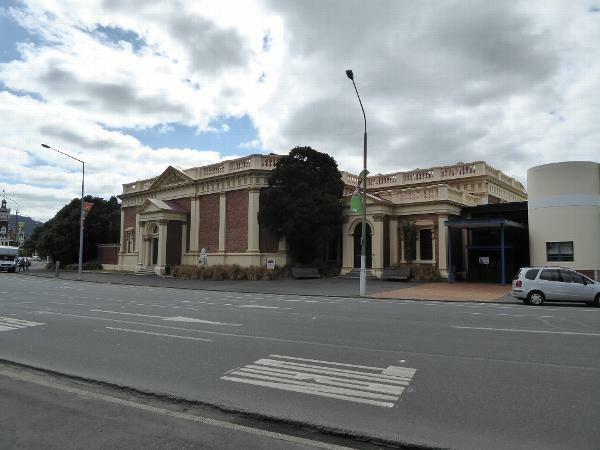 It's partly housed in an old bus station. 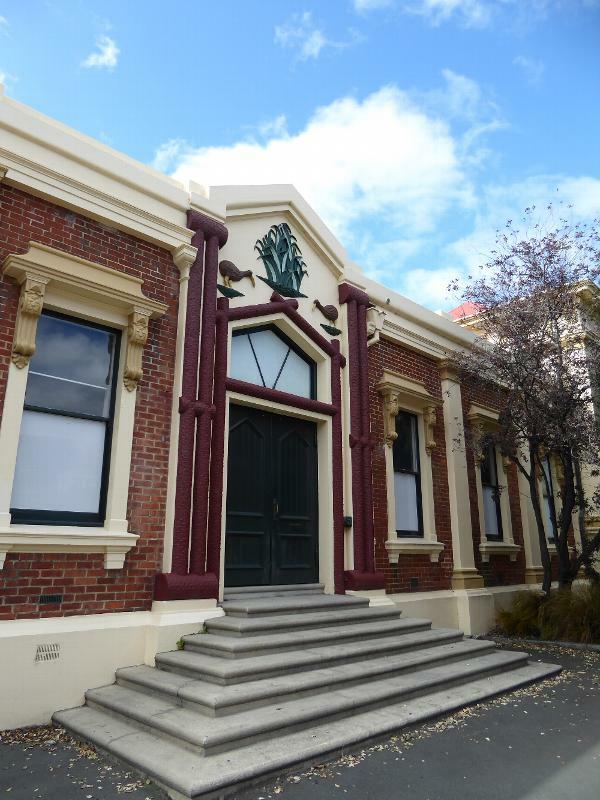 The museum was created by the Otago Settlers Association, established in 1898 to celebrate the 50th anniversary of Dunedin's settlement. 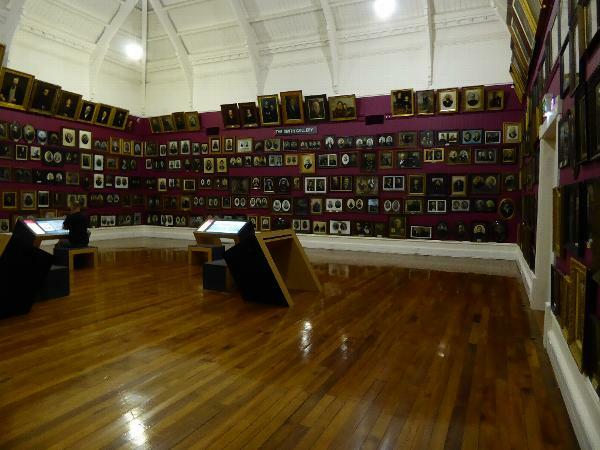 Members had the foresight to collect family photos, displayed in this extraordinary room. The computers allow visitors to search the settlers and retrieve a lot of biographical detail. 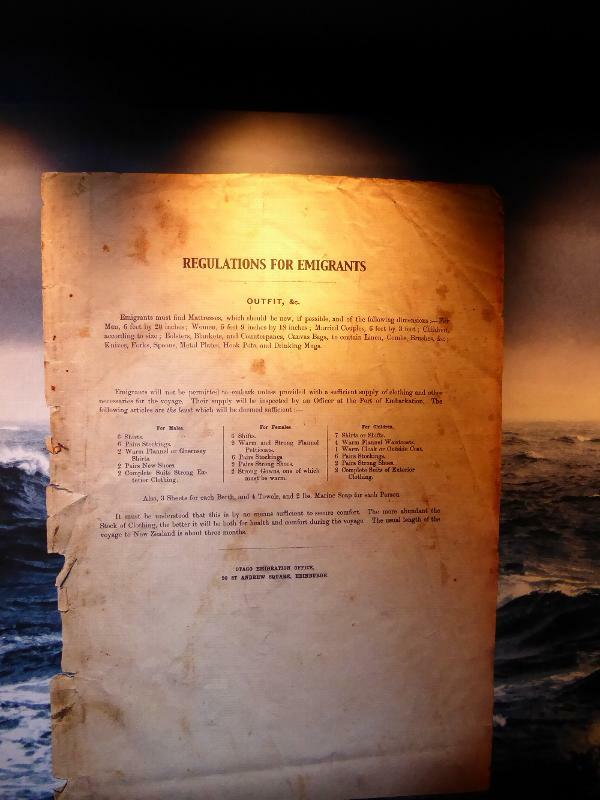 Here, also in the museum, is a handbill of regulations governing the pioneers' departure for New Zealand. It's posted in a mock-up of a tiny ship, mounted to move as though at sea. The movement is almost imperceptible, yet perhaps for that reason many visitors become almost instantly queasy, for reasons that for several uneasy minutes they can't understand.